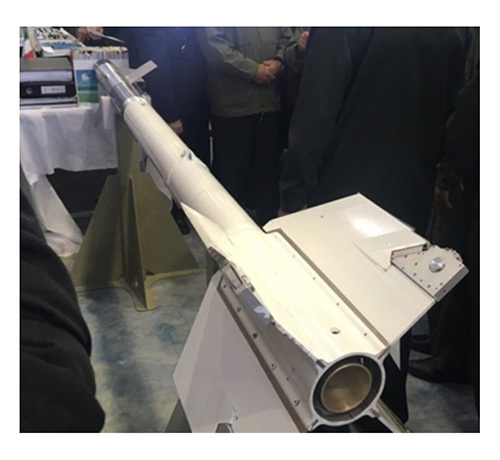 The Islamic Revolution Guards Corps (IRGC) on Wednesday unveiled a new anti-armor missile, ‘Azarakhsh (Lightening)’, and inaugurated an aviation training center, Fars News Agency (FNA) reported. The anti-armor Azarakhsh missile has been developed to be used in low-altitude air operations and against ground targets. The missile that weights 70 km can destroy targets 10km away at a maximum speed of 550 m/s. The explorer of this thermal missile locks on targets at a maximum distance of 6 km. Also, a well-equipped aviation center, a helicopter research center and a center for specialized helicopter overhaul center were inaugurated near Tehran in the presence of IRGC Commander Major General Mohammad Ali Jafari and other Armed Forces' commanders. Meantime, the IRGC’s Mil Mi-17 helicopters were equipped with night-vision systems during the ceremony to inaugurate the specialized helicopter overhaul center. Earlier this month, Commander of the Iranian Ground Force Brigadier General Kioumars Heidari announced that the country’s experts are working on a unique project to produce an advanced anti-armored missile launcher. “Today, a type of anti-armored missile launcher is being built which is considered as an exclusive project and can provide the Ground Force with unique capabilities in area of anti-armored (weapons),” General Heidari told reporters.